On July 26, after flying into Lhasa Gonggar Airport, Chinese Premier Li Keqiang traveled directly to a construction site on the Lhasa-Nyingchi section of the Sichuan-Tibet Railway in order to investigate the design and progress of construction. 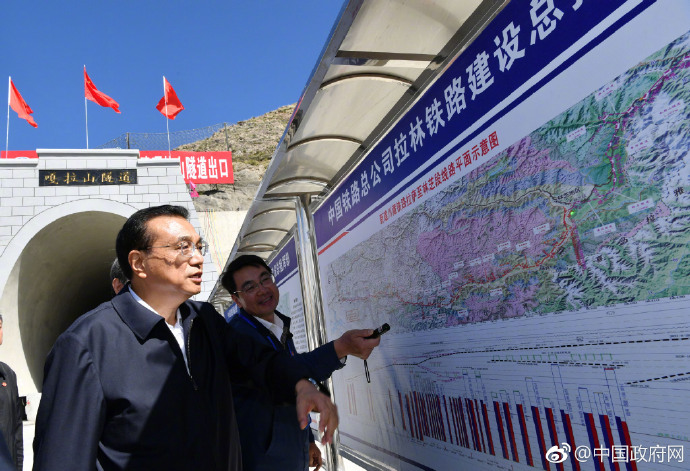 Premier Li visited the 3,500-meter-high Kala Mountain Tunnel, where he got down twice to carefully inspect the quality of construction, demanding that everything should be fit together perfectly and keep improving it. Premier Li Keqiang inspects the construction site on the Lhasa-Nyingchi section of the Sichuan-Tibet Railway on July 26. Image source: Chinese Government Online. The Kala Mountain Tunnel was officially connected on April 7 of this year. It is located within Chushur County, Lhasa Prefecture and Gonggar County, Lhoka Prefecture and is the first tunnel on the Lhasa-Nyingchi section of the Sichuan-Tibet Railway. It is also a difficult engineering project and one under constraints of a time limit. It has a total length of 4,373 meters, a maximum buried depth of 674 meters, and lies at an average elevation of 3,600 meters above sea level, so construction conditions here are complicated and difficult. 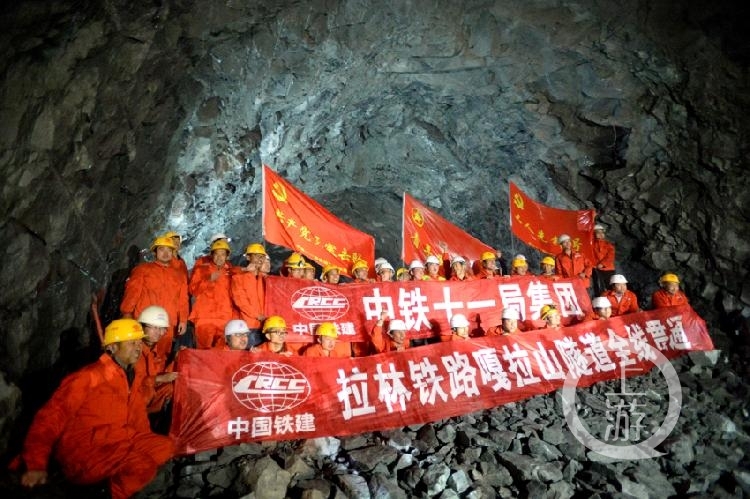 After the Kala Mountain Tunnel on the Lhasa-Nyingchi section of the Sichuan-Tibet Railway was connected, construction staff cheer for a group photo in the tunnel. Image source: Shangyou News. According to reports, the tunnel passes through a layer of Aeolian sand, an area susceptible to dangers of falling rock, and a section of a fractured fault, where the surrounding rock changes frequently and inrush of water is a serious issue. To deal with this, the China Railway 11th Bureau Lhasa-Nyingchi Railway Engineering Command Post actively carried out technical, strategic, and special research to tackle the problem, formulating special technical programs and measures to strengthen management and control of the construction process. Through hard work and joint efforts of all parties involved, the tunnel was connected safely and smoothly. On June 9, the first sleeper train for the Lhasa-Nyingchi section came off the assembly line. It is expected to be officially laid on the railway track in September, and passenger operations on the whole line are expected to begin in 2021. The Lhasa-Nyingchi Railway is Tibet’s first electric railway line. It will start in Lhasa and end in Nyingchi, with a total length of 435 kilometers and a design speed of 160 kilometers per hour. The line spans the southern valley between Mt. Gangdise and Nyenchen-Tanglha Mountain in the Himalayas, and it crosses the Yarlung Tsangpo River 16 times. More than 90 percent of the line is located at 3,000 meters above sea level on the plateau. It currently has the most complicated geological conditions and is the most difficult project in China’s construction of a railway on the plateau. It will also be a common section shared by the Sichuan-Tibet Railway, Yunnan-Tibet Railway, and Gansu-Tibet Railway lines. The Lhasa-Nyingchi section is an important part of the Sichuan-Tibet Railway. Construction began on December 19, 2014, and the total length of the main line is 402 kilometers. The total construction period is seven years. After it is completed, southeastern Tibet will finally be connected by railway, and the line will become an important transportation installation for foreign exchange with southeastern Tibet. It has great practical significance and profound historical significance for promoting economic development and interconnection along the line. At the same time, the route from Lhasa to Nyingchi is rich in tourism resources. After the Lhasa-Nyingchi Railway is completed, it will form a world-class landscape corridor, promoting the development of tourism resources along the route and extending tourism resources outside to attract more tourists from the Central Plains region and Yangtze River Delta to visit western China, which will cultivate new economic growth points for the areas along the route. “The Lhasa-Nyingchi Railway will relieve some of the transportation pressure on the Qinghai-Tibet Railway. Through the railway, the resources of National Highway 318 will be further developed and become more effective. The Sichuan-Tibet Railway will become another landscape avenue for China,” Kelsang Tsewang, deputy director of Development and Reform Commission Railway Office of Tibet, said. The Sichuan-Tibet Railway is known as “the most difficult railway to build”. The line was surveyed in the 1950s but construction did not begin until 2014. The line steps are eight to eight volts, and the cumulative climb height exceeds 1,400 meters. The line will begin in Chengdu, Sichuan Province and pass through Pujiang, Ya’an, Kangding, Litang, Baiyu, Jomdo, Chamdo, Bangda Township in Baxoi County, Nyingchi, Lhoka, and finally arrive in Lhasa. It will have a total length of 1,600 kilometers. Once the Sichuan-Tibet Railway is completed, it will only take 13 hours to travel to Lhasa from Chengdu, Chongqing, or Xi’an on China Railway Highspeed (CRH) trains.